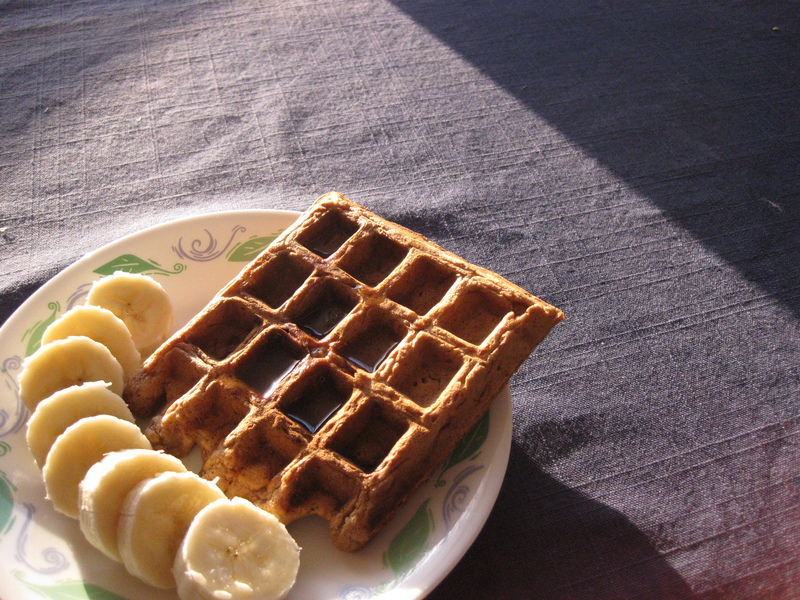 veganmofo 11: Waffle Love | Go Fork Go! I’m out of the office this week so that means that I’ve been terrible at veganmofo posts. But here’s one. I’ve always longed for a waffle iron or waffle maker. But I’ve always been too cheap to buy one. I finally sucked it up and bought one last Saturday. And I got to use it at a brunch I hosted for some friends on Sunday morning! I made the raised waffles and ginger pear waffles from Vegan Brunch and VWAV, respectively. Raised Waffles: These are amazing. Seriously, they’re like waffle-shaped slices of fresh bread. The yeast really gives it a bread-y taste. It’s just chewier than bread, of course. As you can see, I wasn’t very good at figuring how much batter to put into my waffle iron, even using measuring cups and following instructions. I got a lot of non-rectangular cut-off waffles. Whatever, it didn’t affect the taste any! Ginger Pear Waffles: These had an awesome ginger-y flavour. Couldn’t taste the pear flavour quite as well but they were still pretty good. I don’t think pears are in season now anyways lol. 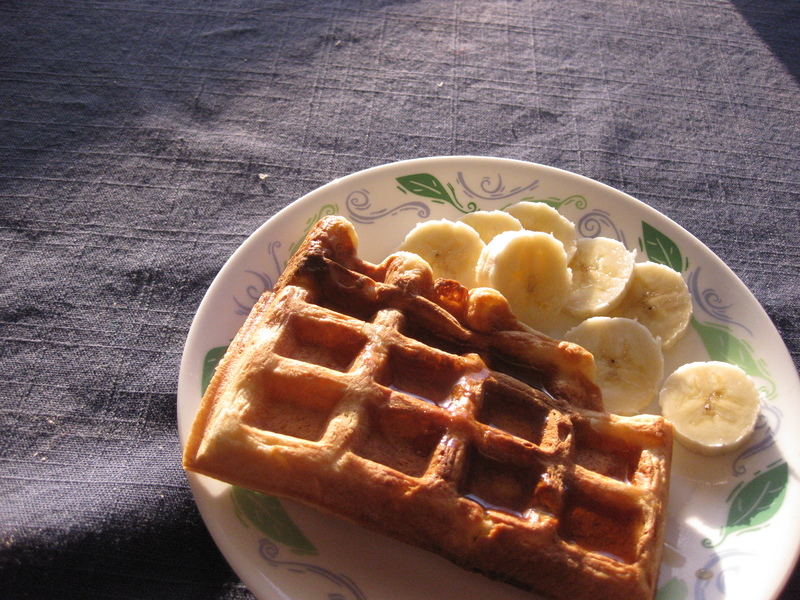 Last night, I saw a banana-oatmeal-raisin waffle recipe in VWAV or Vegan Brunch (I think). I have a ton of bananas at home so I think I’m going to try that next. And I haven’t run since Saturday since my band was in a studio recording during the weekend and I got 5 hours of sleep Sat and Sun night so I didn’t feel like running Sun and Mon morning. I’m also working an hours’ drive (or so) away from home right now, so by the time I get home it’s dark and I’m too tired to run 😦 Last night I was super sleepy on the entire drive home so I decided not to run. Sadly, I stepped on the scale this morning and I swear I’ve put 5 lbs on from the lack of running. Ack! I love waffles! You’re right they are so much quicker & easier than pancakes especially if, like me, you only have a pan big enough to do one smallish pancake at a time!